Watch videos created by others to decide what kind of video you would like to create. Search for material you would like to use for your own video. Edit the order and length of audio and video and add text and overlays to create your own video. Leave a "Comment" (1) on videos you like to share your thoughts or ask questions. You can share your video with friends via email or use the "Embed Link" (2) to paste it into your blog. Tagging a piece with a "Keyword" (3) allows you to search for similar-themed videos. You can add all the "Materials used in this piece" to your "Viewed Items" (4) with just one click. Under "Search by Creator", users who have posted three or more videos using the same nickname will be listed. An "Album" is a collection of materials. Use "Watch as a compilation" (1) to view collections of materials compiled from the different points of views of various users. You can add them to your "Viewed Items"(2). 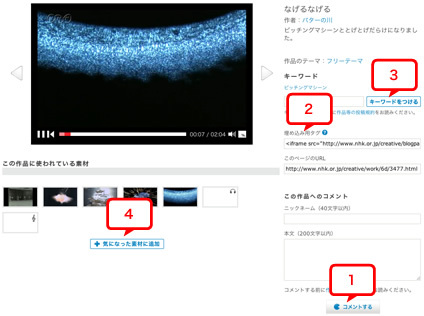 The same as for other people's videos, you can leave a "Comment" (3) on albums you like. Search for materials by category, location, or keyword. You can leave comments on materials that interest you. The same as for videos, you can share materials with friends via email or paste it into your blog. You can download materials one by one (mp4 files compressed as zip files.) You can also download materials as a bundle. Video materials that have been compiled by category or album may be viewed in succession with music, by clicking on . 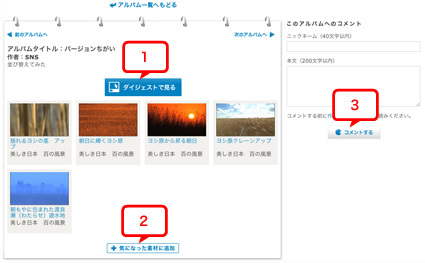 While watching the video, you can add it to your "Viewed items"(1) or view detailed information on the material's webpage. (2) You can change the music during playback. (3) You can change the lengths of the videos. 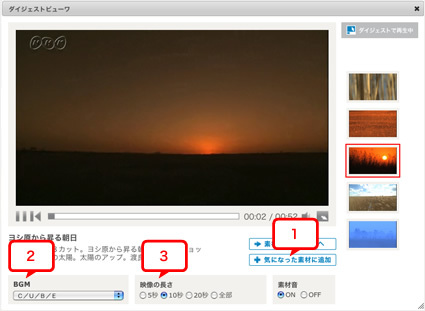 When you watch video material, it will be added to your "Viewed Items"(1) at the bottom of the screen. A maximum of 30 items can be saved. After that, items will be deleted one by one starting from the oldest one. A Material can be saved by clicking ☆(2), or deleted by clicking ×. A Material with a lock icon next to it cannot be deleted as it is being used for a piece under construction. Using your "Viewed items", you can create videos and albums on the "Create Video" page, or download the materials as a bundle. *Note: Your list of "Viewed Items" will be deleted if you don't access the website for a certain period of time. 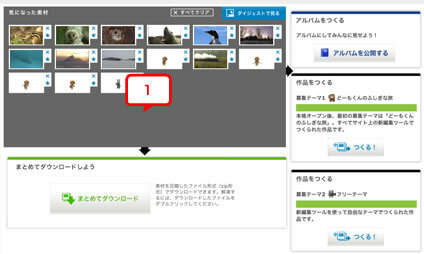 Go to "Create Video" to use "Viewed Items"(1) to create and contribute a video for an applicable theme (Japanese only). You can also share it as an album or download as a bundle (Japanese only). Edit audio and video on the site to create a video that fits an applicable theme. By using the Editing tool, you can change the length of and connect audio and video clips, and add text and overlays with a few clicks. "Contribute" your finished video to share it on the "View Work" page. Click here to get a detailed explanation of how to use the Editing tool. If you upload three or more videos using the same nickname, you will be listed in the "Search by creator" section under "View Work". Even if you leave the Editing tool, you can resume editing later. If you collect materials you like and save it, you can share your collection with everyone as an "Album". You can transfer materials to your "Viewed Items" from albums as a bundle, making it useful for creating your own video. Click here to view a list of Albums. Video materials in your "Viewed Items" may be downloaded as a bundle. *Note: It will be downloaded as one zip file.If you double click the zip file, each video clip will become an individual mp4 file.If double clicking doesn't create individual files, please use a program that can decompress zip files.